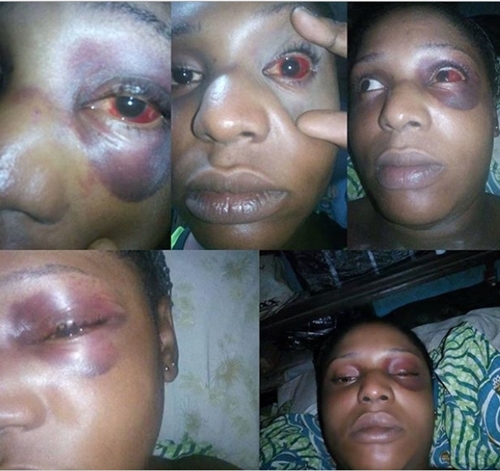 A lady identified as Amarachi Azubuike, has giving graphic details of her experience in their hands of an armed robber in Lagos while she was returning from school in December, 2017. Narrating how it happened, Amarachi said: “I was on my way back from school as at 21st December, at oshodi express way. "The hold up was much then I decided to enter a motorcycle not knowing the motorcycle I entered was an arm robber, we negotiated how much I would give to him and he agreed. "Getting to a particularly spot, he told I should get down that it seem his motorcycle was faulty, me now poor girl, I just did as he said, I stood waiting for him to work on his motorcycle at the lonely road because it was already late. "The next I saw was a gun pointed at my face telling me to bring my money, phone and my chain or he r*pes me. Immediately with fear I did, not just that, he had to punch me twice heavily on my eyes and nose. "I fainted. My nostril was bleeding as well. I managed to open my eyes only for me to see myself on a motorcycle with a Good Samaritan that helped me to the clinic close by. I thank God for my life I wasn't blind.